In 2014 RSSB’s (Rail Safety and Standards Board) innovation programme launched a competition titled ‘Tomorrow’s Train Design Today’ to identify passenger rolling stock designs that will provide ‘a glimpse of the future’ and showcase the capability of the rolling stock supply chain to deliver key elements of design to the rail industry. The German Aerospace Center’s (DLR) proposal was the ‘AeroLiner3000’ and Project Manager Joachim Winter explains more. The goals of RSSB’s competition were formulated to be very open, but with one main restriction: not to touch the basic infrastructure. A main driver of the competition brief is the 4Cs: capacity, low-carbon, customer comfort, and cost-sensitive innovation. Andreas Vogler Studio1 (AVS) teamed up with the DLR to propose a high-capacity double-decker high-speed train to run at up to 400km/h on the new HS2 high-speed line from London to Birmingham and be able to continue on the existing lines as far as Edinburgh. The resulting train, named ‘AeroLiner3000’, made it through the feasibility study and is now, as a competition finalist, in the demonstrator phase with the construction of a 1:1 scale mock-up currently underway and will be shown at InnoTrans 2016 in Berlin. The DLR’s Next Generation Train (NGT) project2 incorporates many logical concept steps for future train development. Therefore, AVS approached the DLR for cooperative participation in that competition, knowing from experience that a good design needs good engineers as well. The work-split was easily given by competences: AVS is the main contractor to the RSSB responsible for the design and the DLR contributes with innovative systems technology solutions. The primary objective of the AeroLiner3000 feasibility study was to outline and define a new approach to a high-speed double-decker train for the future GB high-speed rail network, consisting of HS2 and its planned connections into the existing network by so-called ‘classic-compatible trains’. Next to a compact and clever spatial arrangement to achieve a high capacity double-decker layout in the limited GB gauge, the study looked into the potential of extreme lightweight design. The train concept, car construction and running gear were identified as having the largest immediate impact on weight savings. The potential of double-decker cars was explored for line capacity improvements and for futureproof line development. For the objective of customer satisfaction, some of the main psychological issues and possible countermeasures have been identified. In rail traffic terms, an operating speed of 200km/h or more is classed as high-speed. In recent decades the development of the Shinkansen, TGV and ICE vehicles has played a prominent role in high-speed international traffic. These and other rail vehicle concepts, which are predominantly used and continuously further developed in various countries in Europe and Asia, differ considerably and show that speeds of up to 400km/h can be achieved in regular operation through various different approaches. In the analysis of these different concepts it became particularly clear that specific requirements have led to different vehicle configurations. In the UK the structure gauge for main-line tracks is smaller than in continental Europe. Because of this, the comparability with trains in continental Europe is limited. In particular, the maximum height is lower than the European G1 structure gauge. This leads to a challenge for the realisation of double-deck cars. 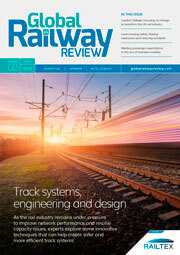 A focus on new concepts and approaches is required in order to enable double-deck trains. The analysis of the state-of-the-art showed no clear conclusions regarding the lightweight potential of train concepts. Furthermore, the construction styles of the car-body showed that there are exceptions but the weight is highly influenced by the specific design and requirements. The complex relationship of the train concept, the type of the car (single- or double-decker), and the different requirements has led to a large number of solutions. Out of these solutions it is possible to define the train concept, the type of car and the car-body length with the highest lightweight potential by using a methodical approach3. The Next Generation Train (NGT) is a double-decker concept family. The NGT HST4 is a 400km/h high-speed train fitting into continental Europe’s G2 gauge. A half-train consists of two 21m-long end cars and eight 20m-long intermediate cars. The cars have mechatronic independently rotating wheel single running gears. Power at the wheel is 16 MW at maximum speed, 63% of which is provided by the end cars, with the remainder provided by 190 kW near-wheel motors of the intermediate cars. For noise and wear reasons, the intended power supply is by inductive power transmission using the full train length. The service brake is realised by coasting and dynamic braking. A half-train seats 790 passengers and weighs 384 tonnes. The passenger flow concept is split into embarking and disembarking passengers on bi-level platforms. The baggage is handled automatically. This allows for five minute dwell times at node stations. Over the past two decades double-decker cars have greatly helped to increase capacity for train operators, especially in Europe, but also worldwide. However, due to historical reasons Great Britain has been greatly restricted by its limited gauge and generally double-decker cars are not considered5. However, originally implemented as an experiment, the UK had the ‘Bulleid Double Decker’ car SR Class 4DD in operation for more than 20 years from 1949 to 1971. As the compartments were alternately high and low, to ensure that the overall height of the unit was within the clearances necessary to pass through tunnels and under bridges, the ‘Bulleid Double Decker’ was more a split-level than a true double-decker. The 4DD was somewhat unsuccessful because the upper level compartments were cramped and poorly ventilated (the upper level windows could not be opened due to tight clearance). The compartments were pressure-ventilated but the equipment proved to be troublesome. Dwell times at stations were lengthened because of the increase in the number of passengers per door. Finally, to obtain the extra seating capacity that was being sought, it was instead decided to lengthen trains from eight cars to 105 and to further decrease the seat pitch. Route capacity is a factor of train capacity, train spacing, and station dwell time. Whilst double-deck trains can carry more passengers per unit of floor area, their dwell times at stations tend to be longer than well-designed conventional rolling stock. Thus, route capacity is only increased if the latter issue is more than compensated by the former. On GB (suburban) routes where additional route capacity is required, double-deck trains (because of stopping patterns) would have to use a different concept than a long-distance train, allowing more doors and faster passenger flow. However for the planned ‘Classic-Compatible Trains’ on HS2 with travel times of minimum 49 minutes (London–Birmingham)6 and maximum 3.5 hours (London–Edinburgh) there is an important case in this study. Whereas freight trains still use the conventional configuration of a locomotive pulling cars, in passenger service there is a widespread trend towards replacing locomotive-hauled trains by multiple units (MUs). In MU stock the traction equipment can be concentrated in power heads or can be located completely or partially in a decentralised fashion along the cars. This way locomotives are replaced by driving trailers at one or both ends, thus yielding much lower mass per seat. In addition, the need for fitting motors and transformers into the limited space inside the car has been and still is a major driver for mass-reduced traction components. Replacing a restaurant car with a regular car is another effective means of decreasing mass per seat. Many operators fear, however, that with such a measure travelling by train could lose its attractiveness. Thus, they often at least provide a bistro. The AVS combines architects and industrial designers that have worked in aerospace and airline design and who are familiar with designing small spaces. Many comfortable, even luxurious, means of travel don’t offer full standing height, examples being LearJet or other private jets, London double-decker buses, cars or helicopters. Also, in aerospace lightweight is a prime objective. The prime design driver for AeroLiner3000 has been to transfer the methods of aerospace thinking into the world of railways – by engineering and by design. 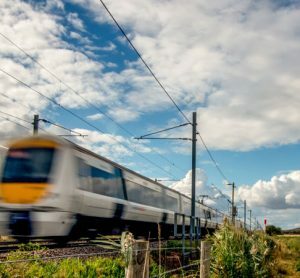 The AeroLiner3000 proposal has set itself the goal of investigating a double-decker high-speed train following the HS2 Classic Compatible Train Specifications 20127. 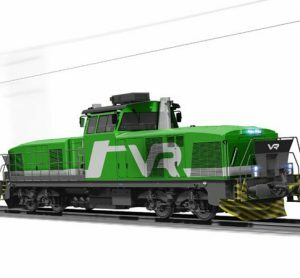 The resulting concept is a 200m trainset, with 20m-long end cars and 17m-long intermediate cars, each with four individually powered and controlled wheels at the very end to form an innovative virtual Jacobs-bogie8. The axle loads are 17 tonnes. The cars’ construction consists of continuously bent equal diameter steel tubes that are laser welded, achieving an extremely lightweight construction, which becomes also apparent in the large windows with their very slim diagonal posts. The total weight is approximately 25% less than a conventional car-body. Each car has two small toilets and six priority seats on the lower-deck. Depending on the train layout, a 200m trainset with at least 627 and up to 700 seats can be achieved. This compares to a TGV Duplex with 510 seats. A half-train of the double-deck AeroLiner3000 electrical multiple unit (EMU) consists of two end cars and nine intermediate cars with independently rotating wheel running gears to allow for passage on the lower-deck. The middle intermediate car is a multi-functional car which can accommodate a restaurant. The 374 tonne train is capable of running operationally at up to 400km/h on high-speed lines. Fitting into the GB PG1 gauge enables it to run on many other lines of the GB rail network as well meaning that the AeroLiner3000 will not have negative impacts on existing infrastructure. The propulsion system has a power performance of 12 MW at the wheel to achieve maximum speed. This power is equally distributed over the 44 near-wheel motors, which provide 270 kW each. Both end cars have pantographs for the AC 50 Hz 25 kV overhead catenary system (OCS) and, of those, only one is usually in operation to avoid oscillation of the OCS. In normal operation the train slows by coasting and dynamic braking can then be used for greater deceleration. 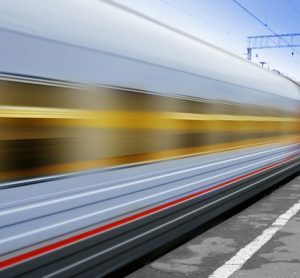 In an emergency the train applies additional eddy-current brakes at speeds between 250km/h and 50km/h to comply with the TSI High-Speed. Additionally, for stand-still there is a friction-based brake. The intermediate cars are permanently coupled by a central buffer coupling with half-trains having a virtual coupling to increase the operating flexibility within ETCS L3 train protection. A 410m full-train with 1,400 seats consists of two virtually coupled half-trains. The aerodynamic design of the entire train culminates with a super-elliptical shell surface between the nose and the roof of the end car, fully covered wheel sets and car connections, and seamless undercarriage. The drag, and therefore noise, is very low. The end car front is designed with medium fineness ratio because it is assumed that in the future tunnel portals on high-speed lines will be constructed in order to cope with the train pressure head wave. The cross wind stability of this lightweight train is currently under investigation in a wind-tunnel. Comprehensive use of lightweight design techniques that reduce the weight of the car-body by 25% as well as optimised aerodynamics, reduce operating and maintenance costs and limit carbon dioxide and noise emissions. Furthermore, the weight savings will enable a double-decker car for GB PG1 gauge to be in line with the TSI-PRM standards and offer better seating comfort than many UK trains currently in operation. The load-bearing structure of the car-body is adapted to the individual requirements and loads, with structural characteristics that are needed to ensure stability. This means that the interior design can be optimised, for example with regard to the design and shape of the upper-deck floor, making a double-decker concept with high flexibility possible. The passenger comfort is achieved through reasonable seat pitches of 830mm, low noise, pressure variations and vibration, and with improved air conditioning and interactive smartphone-based passenger information. The AeroLiner3000’s design is optimised to achieve five minute dwell times at stations, despite seating approximately 30% more passengers than a TGV Duplex. To this end, baggage is taken care of by a robotic baggage handling system with passengers checking-in their baggage in the centre of the platform. The airflow ventilation system is taken from that of modern airliners. An innovative heating, ventilation and air-conditioning (HVAC) concept for the specific situation on the AeroLiner3000 could be developed. The illumination concept employs organic light emitting diodes (OLED), which are well suited to this application since they can be built into the ceiling with a depth of less than 3mm, providing a glare-free, dimmable, comfortable light. The illumination system works together with shading of the windows and pro-actively takes tunnels into account. Transfer electric car thinking to railways. Carbon Dioxide Reduction is a combination of all the elements that constitute the system: infrastructure, rolling stock and operating conditions. Carbon dioxide emissions account for half of it associated with the infrastructure. The rolling stock already has very low emissions compared to that of cars. By increasing passenger capacity carbon dioxide per passenger will be significantly reduced. Capacity can be meaningfully increased by using double-decker cars, although the notional gauge of GB trains are very limited. Customer Comfort is increased by careful ergonomic detail design within the geometric restrictions of the gauge; by incorporating comfortable seats and elegant materials; and shall be further increased through a holistic design approach which includes aspects of psychology, communication and an interactive environment. From the outset the AeroLiner3000 is considered to be an innovation platform which is open to integrating advanced products and services. Rather than the adaption of an existing product for the compatible trains on HS2, the opportunity shall be taken to develop a new concept for GB to spur future innovation on the GB railways. Rail becomes a significant element of the intermodal logistics chain. Increasing demand for trains because of increasing comfort, decreasing costs, etc. The AeroLiner3000 demonstrates an innovative approach to the design of a double-decker train within the GB PG1 gauge allowing for reasonable passenger comfort. This train is intended to serve as an HS2 Classic Compatible Train running at high speeds up to 400km/h on new infrastructure and serving many existing lines as well. Line capacity can be increased by more than 30% without any change to the existing infrastructure. The same aim is for station dwell times to be approximately five minutes. The AeroLiner3000 exceeds the expectations of the original competition call. The train concept is developed to the extent that it could probably hit GB tracks within 7-10 years, given the political will. To allow the railway public to get a feeling for the AeroLiner3000 interior design, RSSB is funding a 1:1 demonstrator mock-up which is currently under construction by AVS. It will be displayed at the InnoTrans fair in Berlin in September 2016 in Hall 2.2 on the German Aerospace (DLR) Stand 405. Joachim Winter Studied Mechanical Engineering with a specialisation in Aerospace Technologies at the Technical University Braunschweig. Between 1987 and 2001, Joachim worked at the DaimlerChrysler Group in different positions of aeronautical engineering and vehicle research. From 1998 he was Head of Systems Engineering of DaimlerChrysler Rail Systems (Signal) – Adtranz as well as Head of the Competence Centre Satellite Navigation. Between 1998 and 2000, Joachim was Head of Marketing & Sales Central Europe at the site in Braunschweig. When Bombardier took over the business in 2001, Joachim became Head of the Profit Centre Satellite Navigation of Bombardier Transportation (Signal) Germany. From 2004 to 2006 he was Director Signalling Technology of Central Engineering in Stockholm and then from 2007 was Director Telematics of Business Unit Central Europe and Site Manager at the site in Mannheim. Since February 2008, Joachim has been Project Manager for the Next Generation Train at the Institute of Vehicle Concepts of the German Aerospace Center (DLR) in Stuttgart.